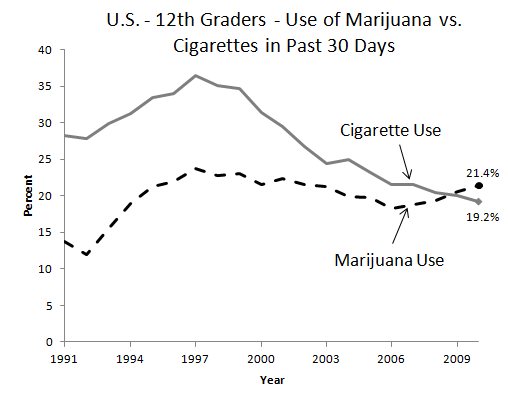 Teen marijuana usage rates have risen slightly in recent years, while tobacco and alcohol usage rates have declined. Of special note, 12th-graders across the nation and in Washington state are now more likely to have used marijuana in the past 30 days than to have smoked a cigarette. There are no simple explanations for these trends. But, it appears that regulation and public education about the harms of legal substances can decrease usage rates, while the criminal prohibition of a substance will not automatically prevent youth from using it. As the debate surrounding Initiative 502 (which would legalize, tax, and regulate marijuana in Washington) heats up in 2012, lawmakers and voters should take a hard look at how our current marijuana laws are impacting youth. I-502 earmarks a large portion of the expected tax revenue from the law towards proven youth prevention and public education programs. This public health approach can work; it already has with tobacco. 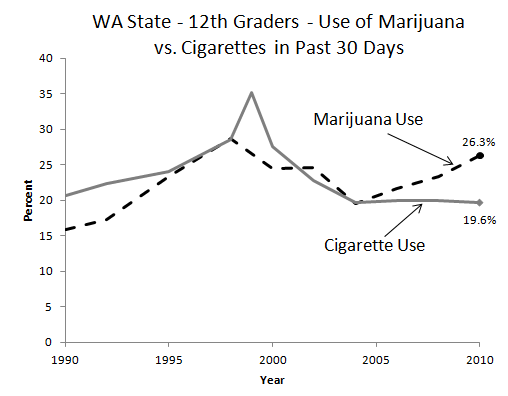 Data Sources: Table 10 (http://depts.washington.edu/thmedia/sections/alcohol/WAState2000Survey.pdf); Page 19 (http://www.doh.wa.gov/tobacco/other/TobFacts-Public.pdf); Washington State Healthy Youth Survey (https://www.askhys.net).